Valletta 2018’s ‘Gozo weekend’ kicks off this Saturday, with three fun activities for the whole family all taking place in Gozo this Saturday and Sunday, 15th and 16th September. These include a performance by Magna Żmien, an audiovisual installation at the Gozo General Hospital and film screenings in Victoria. This weekend-long event is being held as part of the European Capital of Culture Cultural Programme. Entrance to all activities is free of charge. On Saturday 15th September at 8pm, Valletta 2018’s Magnificent Memories Machine, Magna Żmien will be at Cathedral Square inside Gozo’s Ċittadella. The night will be dedicated to the collection of local memories from Gozo, with a program featuring a time-machine performance by Armchair Voyager no. 35, Wistin, and the Banda tal-Memorji Meraviljużi. The audience is invited to engage with the Magnificent Memories Machine itself during this performance, and will also enjoy a sound installation by Timothy Garrett and visuals by Andrej Vujicic. Magna Żmien is a movement to collect, convert and make available fading memories through the digitisation of sound and image home collections. From the project’s inception, 54 Audio Cassettes, 31 Audio Open Reels, 64 Normal 8 Films, 24 Super 8 Films, 422 photographs and 294 negatives have been digitised. These salvaged memories will provide a fertile collective context for present and future cyberspace navigators and storytellers. Copies of the material generated will be given to the National Archives at the end of the project. 1001 Dreams will be launched on Saturday 15th September, at the Gozo General Hospital. 1001 Dreams is an installation consisting of a collage of film sheets and audio recordings which come together to tell a story of dreams and memories. The exhibition will remain open at the Gozo General Hospital until the 26th September, and will be open everyday between 9am and 7pm. During workshops held over the summer months, a group of Gozitan secondary school students and a group of elderly people from different villages in Gozo, worked together to discuss each of their stories, memories and dreams. They were encouraged to document these in the form of audiovisual stories, using voice recorders to create sound recordings, and polaroid cameras to take pictures. 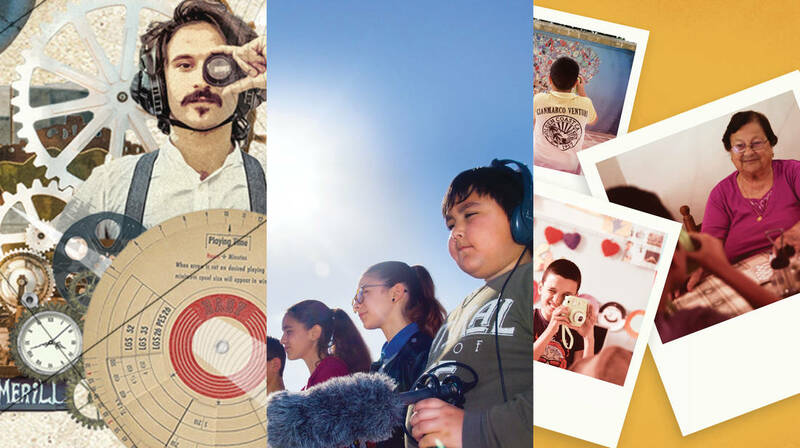 The objective is to document the Maltese story from two different generations by encouraging them to interact with each other as well as with their surroundings, by using photography and visual storytelling to build and enhance relations. 5 short films, created by a group of Form 2 students for Valletta 2018 project Tafxnaf, will be screened on Sunday 16th September at the Citadel Cinema in Victoria Gozo, at 2.30pm. These films were premiered earlier this year during the Valletta Film Festival. Tafxnaf gives children a voice through storytelling and film-making, encouraging young people to develop a sense of ownership over creative projects. Born out of a collaboration with like-minded institutions in Leeuwarden-Friesland 2018 and Aarhus 2017, this project invited all students in Form 2 or its equivalent to submit their stories for publication and to film and produce these stories to create their own original short films. For more information about each of these Valletta 2018 projects, visit valletta2018.org and follow Valletta 2018 on Facebook to stay updated with upcoming events.